We are independent bloggers who love to craft like crazy and show it all off, crafters from the sister group the “Krazy Crafting Crew. Even more crafters have joined this group to bring you many ideas on what to do with those crazy scraps that keep piling up. 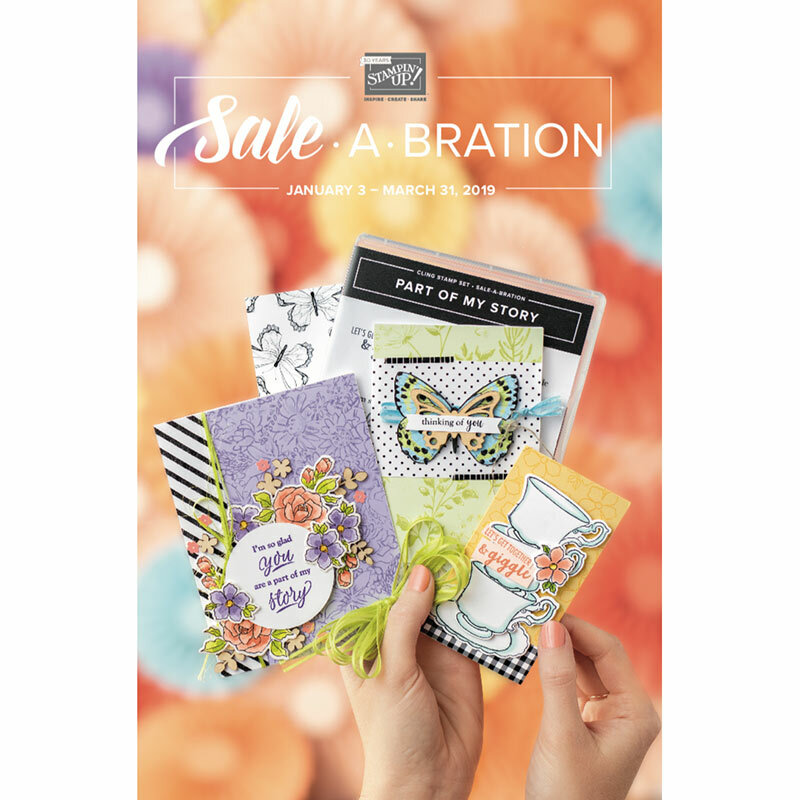 Our goal is to inspire you to go through your stash and create! If you would like to join this team you are welcome to share what you have too with new themes, swaps, challenges and more every month. Just contact Robin or Lissa if you are interested in hoppin’ and scrappin’ with scraps too! Here in Pennsylvania, the early harbinger of Spring can be seen on the buds on my lilac bush. Just yesterday, I saw that the pretty bush survived another winter and buds have formed! I'm so excited to smell its pretty blossoms in just a few weeks' time. I printed out this cute ("hoppy") digi-stamp from my files (originally purchased from Hambo Stamps), and put it on a leftover scrap of EZ Blend paper by Copic Marker. I mounted it on several mats (pink, green) of scrap CTMH cardstock. I bet you don't see that the centers of those papers have been punched for another project! 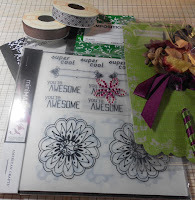 The floral paper is cut from the center of a larger mat for a scrapbook page. And the little bow? It's a 4" scrap of Lovebug Creations' Rumple Ribbon! Now what makes this even more springy is the fact that I added an ADHESIVE SPRING behind a bunny that I duplicated, second from left. The CTMH Adhesive Spring is a bit smaller than original Action Wobbles and it's on a true wire spring (not plastic like Action Wobbles), so it really moves and stands up about an inch off the card -- how fun! These springs are available from Close To My Heart; you can find them HERE. Care to compare Action Wobbles to CTMH Adhesive Springs for yourself? Here's your chance to win a packet of both types of springs, as well as a $10 gift certificate to my CTMH site. Simply be a follower, and leave a comment; one who does will be randomly selected to win the springs and the GC! Our host, Pam, is also having a giveaway (shown at right) and a variety of blogs may be offering some blog candy as well, so be sure to check them out. 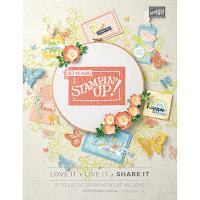 I really love this stamp! Your card makes me smile! Love it! Fun and cheerful. I just love this!!! Reminds me of the little pop up bunnies that you pull down and wait and then they spring to life and scare me silly!!! 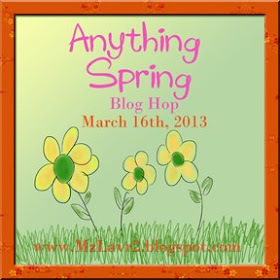 you should come link it up with us over at http://craftindesertdivas.blogspot.com/. We are having an anything goes linky party!!! 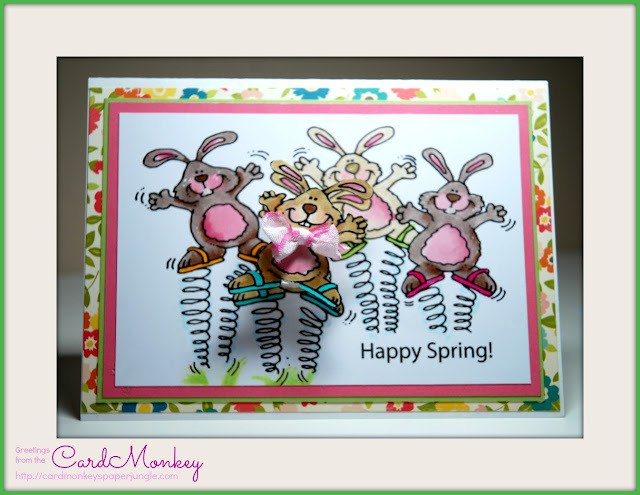 Oh my goodness, those funny, sandal wearing, hippity hopping bunnies are the cutest! Have never tried action wobbles or springs of any kind but this looks adorable! Already a follower of yours! Oh what a fun card. Had me laughing. I'm already a follower. Thanks for the chance to win. ABSOLUTELY THE BEST! GREAT JOB! What a cute card! I used to always cut the middle of my mats out (especially if I really lived the paper!). I hadn't thought to do that for awhile. Thank you for the reminder! So love this card! It's perfect for spring and easter...LOL....The bow just gives it a little something extra!! Too cute!! !